Christmas is the time for treats - tasty biscuits, yummy cakes and of course delicious gingerbreads and homemade fudge! No matter how times change, or how Christmas traditions evolve, treats like gingerbread and fudge will still be Christmas family favourites. And that’s the way it has always been. It is widely thought that gingerbread men originated in Market Drayton back in 1793. 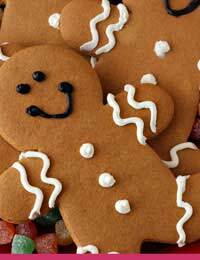 Originally, gingerbread meant simply "preserved ginger" and was an adaptation of an Old French word, gingebras, which came from the name in Latin of the spice Zingebar. It’s not just gingerbread men that are typically made at Christmas - gingerbread houses are just as popular. The houses are covered in icing and used as Christmas decorations, as long as no one gets peckish beforehand! It is thought fudge was actually made by accident! Although there is no definite origination, it is widely believed that a bag of caramels got “fudged” together back in 1886 and the delicious sweet was born. The story goes that that same year a student sold ‘fudge’ in Baltimore for 40 cents a pound. A fellow student got her hands on the recipe and made 30 pounds of fudge for her college auction. The soft chewy treat was starting to catch on and in 1888 the first fudge shop was opened in Mackinac Island in Michigan. Mackinac is now famous for its fudge. In other parts of the United States though fudge tends to mean chocolate and most brownies and chocolate cakes have the word fudge on their packaging. There are a variety of recipes for making gingerbread men and fudge but here are two tasty and simple ones for you to try. In a large bowl sieve the flour, baking soda, salt and spices. Remove from oven, when cool enough to handle use cake cutters to make shapes. Using a sugar thermometer check the temperature of the mixture. Transfer into tin and leave to cool. TIP - You can change the flavour of your fudge by using different extracts, try strawberry extract for a fruity fudge or add some chopped nuts or raisins to the mixture to give it texture. Check out some of our other Christmas Baking ideas.